Welcome back to Part 2 where we discuss what to wear for your first dance competition. Last week, we talked about the Latin and Rhythm dance costumes. Today we are focusing on Smooth and Standard dance costumes. When it comes to your first Smooth or Standard outfit, you want to keep it simple and focus on comfort. In this video, we explain the traditional costumes, as well as newer styles. Whether you go with custom or off-the-rack, there are details you should check for to make sure you are investing in quality garments. Make sure the fabric on the jacket/vest, pants, and shirt are a stretch fabric. Double check the seams by gently pulling the fabric to test the strength. Smooth and Standard shoes are very different from latin and rhythm shoes. The biggest difference you will see is in the heel. Smooth and Standard shoes do not have a Cuban Heel, they look more similar to a formal dress shoe. Also, Smooth and Standard heels will be a lot shorter than the Latin and Rhythm. Typically, Smooth and Standard heels would be 3/4" to 1". A modern trend in Smooth and Standard is patent leather shoes. This style has a nice gloss, which makes them look polished. However, you will need to be careful when wearing patent leather shoes because they have a tendency of sticking together. Remember to always pick a pair of trousers that have some pliability so they fit comfortably and allow movement. 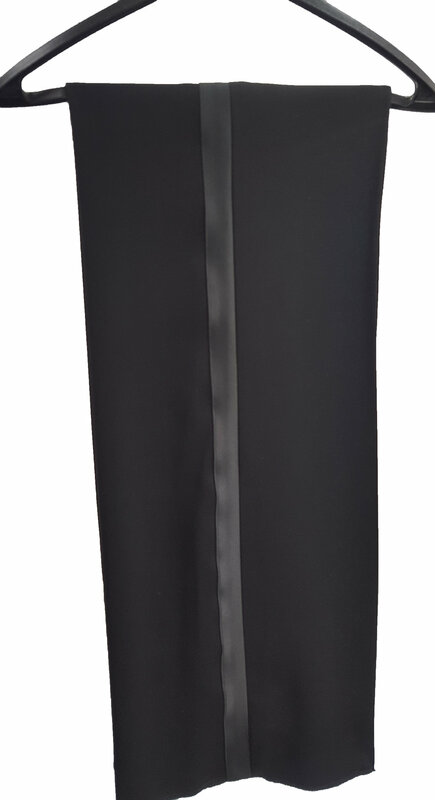 Having a satin stripe down the side of the leg is a classic style as it makes the pants look like evening wear. Pleats or no pleats is completely up to you and what you find comfortable, as the area would most likely be covered by a jacket or a vest. Vest, Jacket, or Tail Suit? With Smooth and Standard, you have some choices when it comes to the upper body. For Smooth, you can wear a tuxedo jacket, single breasted or double breasted. You also have the choice of wearing a Smooth vest. It's very popular to wear a vest that is slightly longer which will cover the top of the trousers. Dance vests have a similar look, but allow more freedom in the arms. For Standard, you can get away with a tuxedo jacket at the beginner levels. When you become a more seasoned competitive dancer, we recommend investing in a tail suit, typical for more advanced Standard dancers.